A few weeks ago we explored the world of digital audio, and audio IP in particular. Today’s technology is making possible the kinds of improvements in sound quality that are starting to rival what was possible with vinyl, even as we sacrifice quality on the low end for the sake of putting even more crappy music on our phones. But researching that story gave me a glimpse of what’s going on at the truly leading edge. It was way too much to try to fit into the other article, so it seemed fitting to give it its own space. It’s really startling to see how much technology – both old and new – goes into creating what are considered the purest, cleanest audio sounds around. Now, if you haven’t been exposed to the world of the audiophile before, you may shake your head in disbelief. Many people do. But, as a business opportunity, there’s big money that certain people are willing to spend to create an unparalleled listening experience. Examples involving older technology include extremely heavy and well-damped turntables to exclude any extraneous vibrations and the exclusive use of tubes in circuits wherever possible. Many years back, in an analog audio equipment store – which used to be just a stereo store but is now a specialty shop – a gentleman counseled me on the benefit of letting your turntable spin for an hour before playing any music on it so that the oil has time to warm up. Seriously. And there’s practically a cult surrounding what some would call the mythology of speaker wires. Given that kind of concern, along with a willingness to shell out six figures for their component systems, it makes sense, then, that companies would invest in some pretty advanced techniques in order to attract business. But this tends to be a boutique business: audiophiles generally prefer the small shop, with hand-made equipment. So, rather than trying to profile companies per se, I thought it might be interesting to look at a few of the techniques being developed to improve the sound of music. These are based on obscure research, with fancy-sounding jargon, but the problems they solve are actually very understandable, even if the solutions are challenging. Before describing some of this technology, it occurs to me that there is a distinct change to how these problems are being approached. In the early days, music was all pre-processed during the creation of a record or tape. Now post-processing is common to accommodate the listening environment. But the next logical step is to process the environment itself. In fact, some of the techniques I’ll describe fall into that category. It represents the latest wave in audio thinking. We’ll start by looking at issues relating to the air in the listening room. The first problem is referred to as Lateral Doppler Distortion (LDD). This represents minute distortions due to moving air as the sound travels from the speakers to your ear. Sound is nothing more than a pressure wave involving air molecules. But if there are currents in the air, some of that sound energy gets dissipated, and, no matter the direction the air current, the frequency changes in small ways due to the Doppler effect. Simple enough to understand; fixing it isn’t so easy. The earliest approach was to set up a system of three very precise air-guns in the room. These were coupled with a sensing system that monitored the air column between the speaker and listener. Very slight puffs of air were emitted, precisely positioned and timed to counter the movements in that column and render it still. There turned out to be three weaknesses to this technology. First, it requires line-of-sight – not always possible. Second, it was very hard to muffle the sound of the air-guns – they sometimes caused more noise than the distortion they suppressed. Third, it became impossible to adjust small localized air movements with a farther-away air-gun because they both involved the speed of sound in air: in order for the air blast to reach the target, it would have to go faster than the speed of sound to impact the target in time. It’s hard enough to get an object to flow through air faster than the speed of sound; it’s impossible to get air itself to go that fast. These issues were all solved by switching to lasers. Instead of moving the air, the air was heated in a way that had the same effect. By positioning mirrors around the room, they could “see” around obstacles, eliminating the line-of-sight problem. Of course, they make no noise, and the beam travels at the speed of light (in air), so all of the air-gun issues were solved. Through high-speed scanning, the system can be used to correct LDD for multiple people. This has the added benefit of allowing a different laser frequency to be used for air movement detection, sharing much of the control circuitry. This laser system was also put to use to solve another issue: Thermal Boundary Reflections (TBR). The temperature of the human body is 98.6 °F (the equivalent in Celsius is obvious and is left as an exercise for the reader); the surrounding air temperature is most likely cooler. This creates a thermal boundary layer near the ear where static air is near body temperature. So as sound travels through the air towards the ear, the temperature is generally constant until it reaches the boundary layer, where the temperature changes relatively drastically. This acts as an abrupt impedance change, causing reflections that distort the sound. It would be unreasonable to have to sit in a100-degree room to listen to music, but the whole room doesn’t need to be at that temperature: just the column of air between the speaker and ear. So the lasers are used to heat just that bit of air to establish a linear temperature gradient to minimize any distortions. They’re actually looking into raising the entire air column to body temperature so that there is no gradient and, therefore, no loss whatsoever. This involves heating the speaker cores and the air inside the speaker so that there’s an unbroken line of material at the same temperature from the moment the sound is created from the electrical signal to the moment it’s enjoyed in the brain. To optimize this, the listener’s own body temperature will be measured and the temperature adjusted. If there is more than one listener, then a compromise will be made between their body temperatures. If this slight error still allows too much distortion, it’s assumed that one listener will banish the other from the room. The only weakness of this approach – particularly when the entire air column is heated – is that, when someone walks through the room, they will break the column. While the discomfort of the person walking is apparently not a concern of the listeners, the air turbulence is an extreme case of LDD that the subtle laser system can’t correct. This remains an unsolved problem; at this point they don’t believe they have any liability for possible injuries sustained by the poor fellow causing the disturbance. The case of the listener himself (or herself, although the customers are overwhelmingly male) moving about the room presents another source of distortion similar to LDD, only this time it’s called Translational Doppler Distortion (TDD). This deals with the Doppler effect resulting from the listener’s own movements. This was considered, early on, to be a less important problem, since listeners overwhelmingly insist on being stationary in an optimal listening location. In fact, some argue vociferously that TDD, along with the sounds of joints moving and circulation feeding muscles, renders the music completely unlistenable. But there have been enough dissatisfied listeners who have had to move to, for instance, accept a pizza at the door or, in one rare case of someone actually trying to heat his own pizza, go check on the smoke smell coming from the kitchen. Apparently the sound becomes so painfully distorted while they move that researchers redoubled their efforts. The solution involves audio post-processing rather than trying to affect the environment (using a laser to blast the listener back into his seat was considered too much of a liability issue). So the listener’s speed and direction are monitored continuously, and the audio frequency is adjusted in the amplifier to compensate for the Doppler frequency changes. There is some delay due to the speed of the sound in air, but the listener’s speed is generally considered slow enough with respect to the speed of sound that the resulting imperfections are inaudible to most listeners. The main drawback with this approach is that it can accommodate only a single listener. This caused a fair bit of hand-wringing until audiophile-turned-researcher Euhiritol N. Urhedd, at the Federal Acoustic Interference Lab, did some sociological studies. It turns out that the overwhelming majority of customers are single. And, for most of the remaining ones that aren’t, there’s a serious dominant/submissive relationship dynamic such that there’s really only one listener that matters. So, while the multiple-listener problem remains, it’s not considered a high priority. 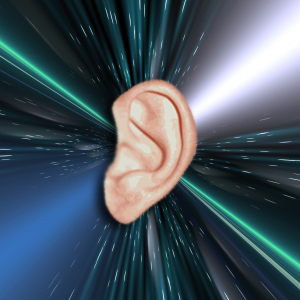 The last effect we’ll consider is a relatively familiar one, only taken to the extreme: the interference of outside noise, formally called Foreign Acoustic Interference (FAI). We understand this from noise-cancelling headphones. But the everyday technology we use can handle only continuous sound like the constant rush of an airplane engine; it can’t correct sudden sharp sounds. The technological advance that allows suppression of FAI lies in developing extremely high-speed circuits that can react and counteract sounds as short as 1 µs (which should be good enough to satisfy those listeners that claim to be able to hear up to 100 kHz). This circuitry is also embedded in the amplifier, and the corrective sounds are added to the original music sound so that the speaker is actually putting out “negative” sound to counteract the interference in addition to the “positive” sound of the music itself (possibly containing TDD corrections). This creates what they call an “acoustic oasis” in the room. Sophisticated audio pattern-matching technology had to be developed since there are some sounds that you really need to allow through. I spoke to one audiophile, Nevir Gudenov, who almost died as a result of a fire in the adjoining apartment. “I was a beta tester for the new technology, and it worked so well that I couldn’t hear the firemen pounding on the door.” Apparently it took an axe through the front door before he broke out of his acoustic reverie and realized there was a problem. Now you can program in specific sounds that will be allowed through. You can select sounds like a smoke alarm, a civil defense alert, and (and this one was hotly debated) your mother or spouse using a specific “safe-word” to call you. It’s been argued that this shouldn’t be an optional programmable feature, but staunch listeners have claimed that they’d rather die in listening rapture rather than suffer the excruciating discomfort of an intruding noise, even if it might save their life. How much of this technology will eventually migrate over to systems that you and I listen to (or whether it might find unexpected space or military application) remains to be seen. For now, there’s lots of work to do for a very few dedicated engineers on behalf of a very few dedicated (and well-heeled) listeners.